The RCV Datum labelling machine is designed to handle and label Sarstedt or conical plastic pharmaceutical vials. 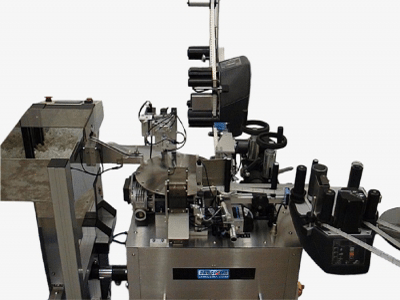 With options of blade or bowl feeding, this turntable based machine can wrap round and place lid labels onto each vial. Available with thermal transfer printer, this machine can easily carry out labelling to these difficult shaped products replacing laborious hand labelling processes. The turntable has several available stations for additional processes if required and speeds up to 60 per minute can be achieved.